I was in my then-girlfriend’s apartment, skimming through New American Stories at the coffee table when I first read Lucy Corin’s work. My then-girlfriend joined me with a mug of tea and I couldn’t contain my glee. It was the story “Madmen,” and I was in love at the first line. “The day I got my period, my mother and father took me to pick my madman.” See what it did? How quickly it established the connection between puberty and the fantastic while normalizing the weirdness with the casualness of ‘my madman’? 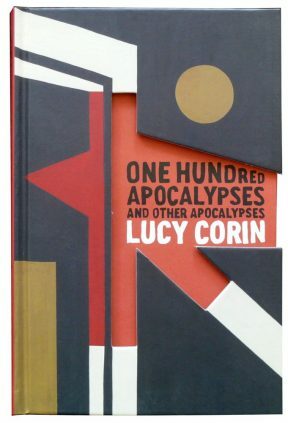 I flipped to the back of the book to read the author’s bio and there, pressed between her name and accomplishments, was the title of Lucy Corin’s short story collection, One Hundred Apocalypses and Other Apocalypses. I remember that moment, first reading Lucy Corin, each time I pick up this book. There are four short stories — “Eyes of Dogs,” “Madmen,” “Godzilla versus the Smog Monster,” and “One Hundred Apocalypses.” The apocalypses are significantly less literal than advertised, but the focus of these stories isn’t on the apocalypses themselves. The focus is on the characters living in them. By having this as the central idea of the book, Corin places very serious external conflicts next to personal, internal ones and gives them both equal, valid weight. Some strange stories are brought to life because Corin’s writing doesn’t leave anything vague or allow confusion. The opening story, “Eyes of Dogs,” is about a soldier coming back from war, with a paraphrased tale of Hans Christian Anderson’s “Tinderbox” as margin notes. These notes stand like fans on the sidelines, inciting curiosity as they tell the original tale more quickly than the soldier’s. Expectations are set up, only for them to crash when the soldier finds himself back in reality. None of the promises of Anderson’s original ending are there, just a soldier stuck in someone else’s apartment and the wondrous apocalypse was probably all in his head. But we aren’t quite sure. Did the soldier’s brain conjure up the fantastic dogs because of mental illness, or was the soldier duped by a witch? The answer isn’t important though. What’s important is how real and frantic his fear of his own perception of the world is, and how pitiable he has become. “Madmen” and “Godzilla versus…” both explore the metaphoric apocalypse of puberty, where the characters’ lives have changed and they have to figure out how they fit into this new world. The narrator of “Madmen” must rush through hers as she tries to adopt her madman at the local asylum, all while competently narrating how this world works. But no one can quite explain how she’s supposed to know which one is hers. She keeps trying to find ways to relate to this important addition to her life, but when she does, she’s shot down. So, she struggles, ultimately finding satisfaction, but only to appease the people around her. Patrick in “Godzilla versus…” has a much easier time with puberty, a slow exploration on finding his emotional place in the world. Then the literal apocalypse happens, but it’s on the other side of the country. He’s trying to come up with the same emotional response as his parents, but it’s so hard to imagine horrors that happen so far away. He can fixate instead on the things that do mean something to his immediate life, like the secrets lurking in his parents’ pasts, or what plans this girl he might like could have. The narrative doesn’t shame him for feeling this way; the questions about his life are just as important as the ones about the world. The closing story, “One Hundred Apocalypses,” is a collection of one hundred apocalypse flash fiction pieces, though there is a range with how literal these apocalypses are. While there are some engaging ideas and forms, such as a piece that was just movie reviews, “One Hundred Apocalypses” became dense and hard to navigate. There are so many pieces so close together that it became hard to parse the individual stories. There is an attempt to separate the stories into four sections, with a brief description of their thematic connections as introductions, but the whole effect is a bit muddled and hard to distinguish. The best part of the whole story though is that the apocalypses aren’t fire and brimstone each time—one hundred ways for the world to literally end would get exhausting. So, while there are apocalypses in the flash fiction pieces, the focus is on small moments. Some forty-year-olds in the apocalypse realize their elementary schools never contacted them about the time capsules they buried. A woman in the apocalypse, who could only eat bread, read menus about all the food at restaurants that she couldn’t have. The end of the world is just a setting, a launching point for stories about people with small lives and comparatively small problems. But, while the title story is an interesting concept piece where I can find individual flash fiction pieces to enjoy, it is the “Other Apocalypses” that really stole my attention. These are three stories that are deep; each delve into different aspects of the human condition and relationships, with conflicting emotions and opinions and characters that I could sink into. The stories they are living are moments of purgatory, the still transitionary moment where one state of living has ended, but the next stage of life has yet to begin. These characters are just trying to survive their lives and what has happened to them, and I can empathize with the conflicts they are facing and why their struggles matter. “One Hundred Apocalypses” isn’t as deeply involved with its characters, but it’s not supposed to be. It’s imaginative and playful, creating interesting ideas and forms so no two apocalypse fragments are the same. Undoubtedly, at least one of these stories and experiences will jump out and dig into the reader, lingering long after they have finished the book — so long as they aren’t distracted by the paperback cover only having 98 apocalypses. Lucy Corin is the author of the short story collection The Entire Predicament and the novel Everyday Psychokillers: A History for Girls. She was an American Academy of the Arts and Letters Rome Prize winner and is a current NEA fellow in literature. She is at work on a novel, The Swank Hotel, from which an excerpt, “Frank Writes a Letter,” can be found in Hunger Mountain No. 21: Masked / Unmasked.